Pocket knives and folding knives often go hand in hand, but if you're looking for an unconventional utility knife that might not even look like a knife when folded up, then the Blue Multitool Credit Card Knife should be the knife in your hand. 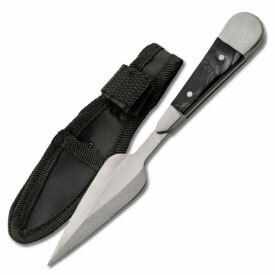 This multipurpose knife has a 2.5" straightedge blade that folds back easily into the rectangular handle. 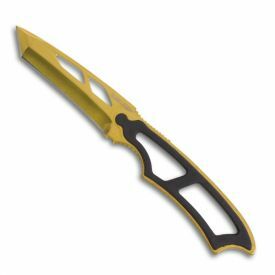 This blue handle is what gives the credit card knife its name, as it is similar in shape and size to a typical credit card that you might use to make an online purchase at KarateMart.com. Don't be fooled by this credit card shape and size. The blue credit card knife won't fit in your wallet's credit card slots, since is a quarter of an inch thick and made out of aluminum. 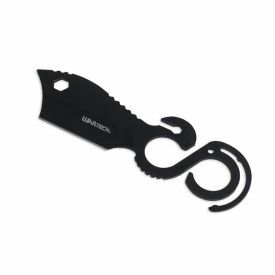 But you can still easily store your multitool credit card knife because it is made with a convenient carabiner that you can attach to your keys, backpack, or dog leash. Two of the corners on the knife handle are actually screwdrivers (one flat-blade and one Philips screwdriver) and the handle even has a bottle opener for those times when you want to drink a cold one. 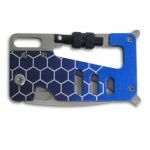 If you'd like a blue multitool knife with a handle shaped like a credit card, then look no further. Add this utility knife to your cart and start carrying around one tool, rather than two screwdrivers, a knife, and a bottle opener. Folded Dimensions (for storage) 3.25" x 1.75"